Lewandowsky and his colleagues used Structural Equation Modelling (SEM) to analyse the datasets. SEM can be a powerful technique which allows complex relationships to be teased out, but it has two disadvantages compared with the Exploratory Data Analysis approach (EDA) that we used. First, SEM requires an underlying theoretical model to describe the presumed relationship between variables, and then estimates the parameters for this model, which renders SEM studies prone to confirmation bias. By contrast EDA allows the data to speak for itself, with the minimum of presuppositions. Second, SEM results are usually presented as diagrams that schematically describe the theoretical model and list the parameters, giving artificial prominence to detected relationships which are not substantial or important. The simpler approach of EDA clearly reveals the strength and importance of any relationship to visual inspection. The rest of this post describes our findings in more detail. LGO13-panel surveyed US citizens drawn from an internet panel. Composite variables for beliefs in climate science (CLIM) and conspiracy theories (CY) were calculated by simple averaging of the relevant question scores on a 5-point scale from ‘strongly disagree’ (1) to ‘strongly agree’ (5). In Figure 2, we summarise the relationships between the CY and CLIM variables in both datasets using loess local regression, which seeks to find a reasonably smooth curve which summarises any substantial structure in the data. Lewandowsky and colleagues’ choice of using CY to predict CLIM arises from a theoretical model in which conspiracist ideation is supposed to cause climate scepticism, although their experimental design does not test the direction of causality. We investigated both directions to avoid any presuppositions, and show the plot which reveals the structure most clearly. This reversal of direction is not important for straight line fits, but is very important when using loess. These plots use ‘jittering’, which moves each data point by a small random amount, to give some idea of the number of repeated occurrences of each data point, and the grey bands show the plausible region in which the best fit lines could lie. Figure 2. 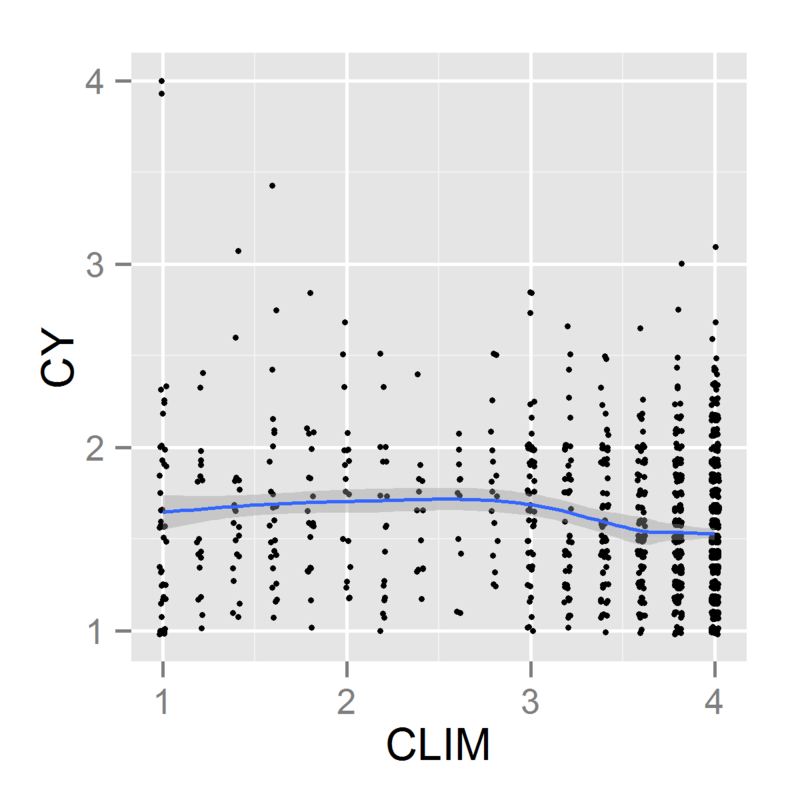 Loess plots of LGO13-panel data: CY as a predictor of CLIM (left-hand plot); CLIM as a predictor of CY (right-hand plot). 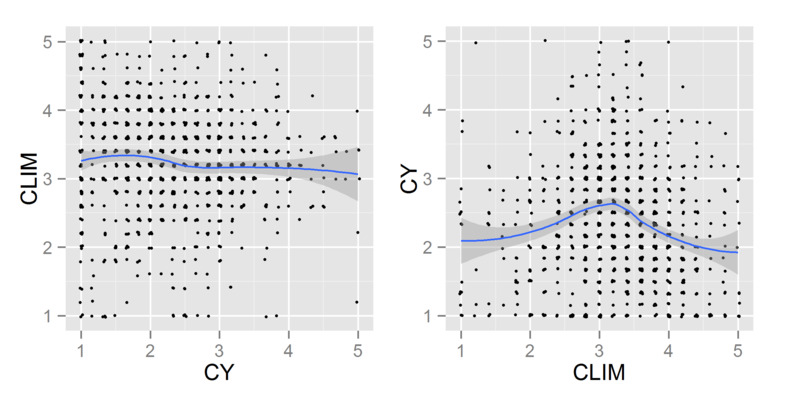 It is immediately obvious from the scatter plots that there is no strong relationship between CY and CLIM, with points fairly evenly scattered over the graph. The best fit straight lines (see Supplemental Table and Figures (pdf) Figure S1) show that CLIM and CY are weakly anti-correlated, that is, agreement with the IPCC consensus view on climate change falls slightly as belief in conspiracy theories rises, as reported by Lewandowsky and colleagues. This relationship is, however, extremely weak, being barely distinguishable from a flat line: a statistical analysis of this straight line fit shows that CY predicts less than 1% of the variation in CLIM. The loess plots in Figure 2 reveal the underlying structure of the data. 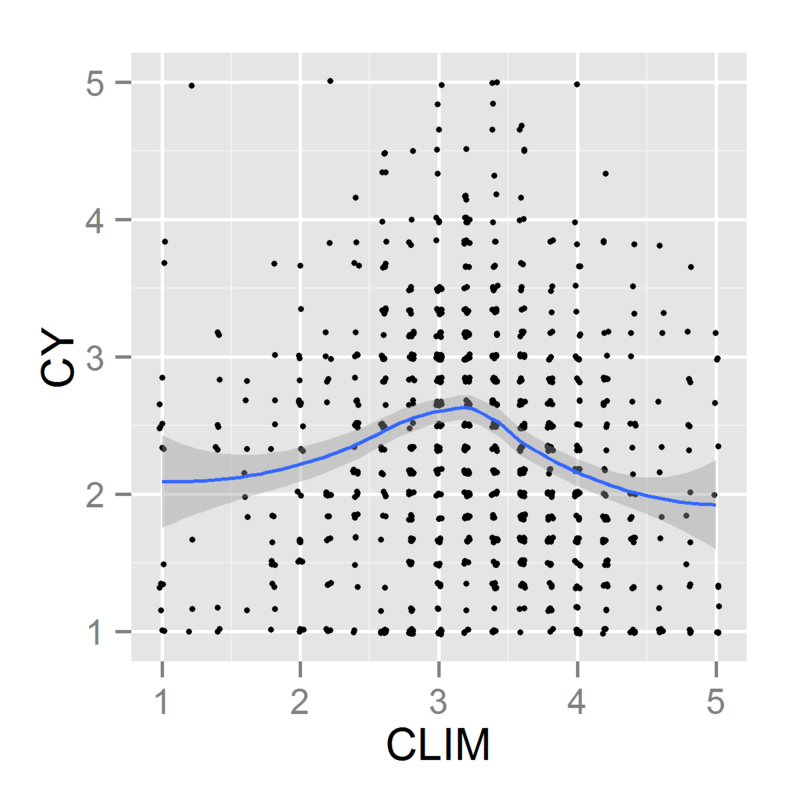 Using CY to predict CLIM (left-hand plot) still shows an essentially flat line, but using CLIM to predict CY (right-hand plot) gives a clear bell shaped curve. The highest values of CY (the greatest ‘endorsement’ of conspiracy theories) occur not for climate sceptics (low values of CLIM), but for people at the middle of the CLIM spectrum, those with no strong opinion either way. The LOG13-blogs survey invitation appeared on climate-related blogs in 2010; responses were on a 4-point scale from ‘strongly disagree’ (1) to ‘strongly agree’ (4). The manner in which this data was collected has been strongly criticised by many commentators, but we do not address that point here, beyond noting that the respondents to this survey were far more strongly convinced of the IPCC consensus position on climate change than the more representative panel survey. By far the largest group of respondents (41%) expressed maximum agreement with all five propositions relating to climate change (CLIM=4.0), while only 15% were ‘more sceptical than not’ having CLIM in the range 1.0–2.4. The stark contrast of the LOG13-blogs and LGO13-panel datasets is shown in Figure 3. Figure 3. 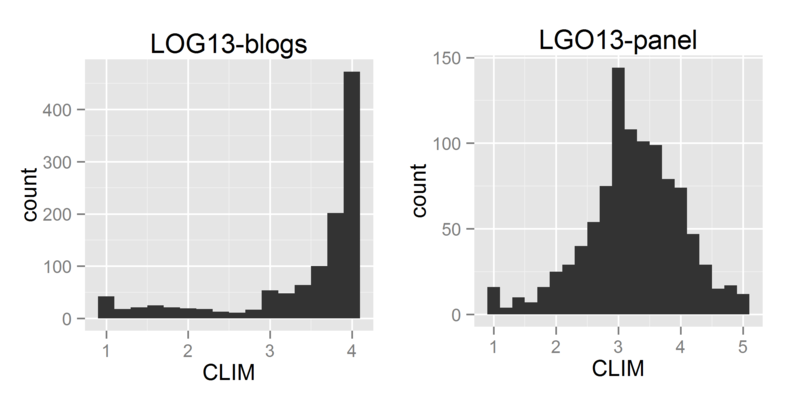 Distribution of responses on the CLIM scale in LOG13-blogs and LGO13-panel. This extreme skew in the dataset makes analysis more challenging, but loess fits to scatter plots are still useful. Figure 4 indicates that the LOG13-blogs respondents with high values of CLIM gave lower credence to conspiracy theories than those at moderate values of CLIM. The behaviour at low values of CLIM (climate sceptics) is much less clear, but there is no sign that the line continues upwards as CLIM decreases, as implied by the conclusion of the LOG13-blogs paper. Figure 4. Loess plot of LOG13-blogs data: CLIM as a predictor of CY. The clarity of this plot can be greatly increased by excluding the 18 data points from the blogs dataset which were identified as ‘outliers’ by Lewandowsky and his colleagues. These points correspond to particularly high beliefs in conspiracy theories (CY>2.5, across the whole range of CLIM). Excluding data points from analyses must be done with care, but Lewandowsky and colleagues specifically noted in their paper that their analysis was robust to the removal of these 18 data points (less than 2% of the whole). The effect on the loess fit, however, is substantial, as shown in Figure 5. Figure 5. 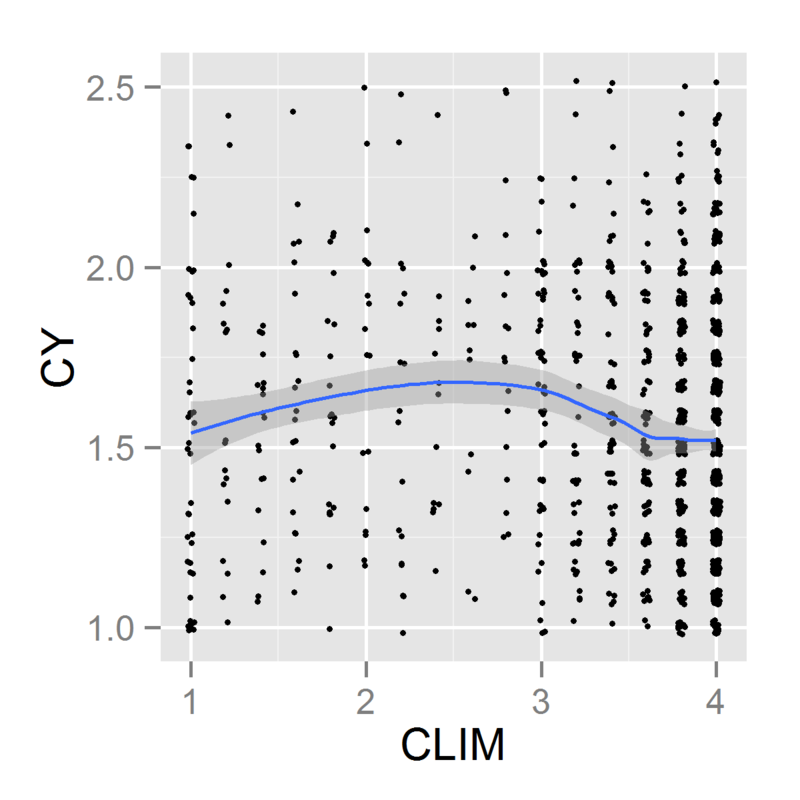 Loess plot of LOG13-blogs data with CY≤2.5: CLIM as a predictor of CY. The LOG13-blogs loess plot now shows a clear fall in CY at low values of CLIM, in agreement with the LGO13-panel data. Lewandowsky and colleagues argue that since any correlation matrix can be fit by more than one model the greatest consideration should be given to ‘theoretically motivated’ models. This appears to us to be a recipe for confirmation bias. Any model can be used to justify a pre-existing prejudice if it happens to meet (in this case minimal) statistical tests. If the authors of LGO15 want to know ‘what does it mean?’ they should look at the data. Our graphs show clearly that the relationship between CY (the average of ‘agreement with conspiracy theories’) and CLIM (the average of ‘belief in anthropogenic climate change’) is bell-shaped. That is, both ‘climate sceptics’ (low values of CLIM) and those convinced of the dangers of anthropogenic climate change (high values of CLIM) were less likely than the ‘climate-neutral’ to agree with conspiracy theories. A very straightforward explanation is that people who have firm opinions (and are willing to express them) are sceptical of (most) conspiracy theories and have polarised opinions on climate change. People who are less sure (or less willing to express an opinion) are ‘neutral’ about both CLIM and CY. Such people tend to occupy the middle of the range on CLIM, but being ‘neutral’ about conspiracy theories places them near the top of the range of responses for CY. Our Supplemental Table and Figures (open access). This document lists the climate and conspiracy questions included in CLIM and CY, and gives brief methodological details of Lewandowsky’s two surveys. It also contains some additional graphs (our Commentary was restricted to one figure with 2 panels). This entry was posted in Bias, climate change, Data, Methodology and tagged Lewandowsky, Psychological Science by Ruth Dixon. Bookmark the permalink. Congratulations! I know I’ve made the same basic point you guys make before, but I never would have been able to write up a good technical explanation like you have, much less get one published in a journal. Awesome job! How many people don’t believe in the conspiracy – depends on how bias the media is. None of the conspiracy theories that make up ‘CY’ was about climate science. Lewandowsky showed that many climate sceptics think that climate science is a conspiracy – what we have shown is that sceptics don’t believe in conspiracy theories in general. Substantial conspiracies are far too difficult to maintain beyond a very small number of people. And there is always a huge reward to be the first to break it. Think how much money and fame the first of the many hundreds needed to fake the moon landings would receive. Whilst also being sceptical on both counts, my rejection of conspiracy theories is somewhat different. It is easy to maintain a conspiracy theory if people want to believe it is true. What makes them implausible it that the “conspiracy” often requires a much greater deal of coordination and knowledge than the more mainstream explanation. For instance the JFK assassination and 9/11 conspiracy theories require vaster amounts of coordination than the standard explanations. Essentially what you have shown is what common sense told us all along, that those who have bothered to study the science seriously, even if only as amateurs, and have come to different but at least reasoned conclusions, have little time for the manic ravings of the Fake Moon Landing, 9/11 Was a Jewish Plot brigade. We are left with a strong feeling that Lewandowsky (especially when his methods were exposed) was only interested in coming to a certain conclusion, reasons unknown. I’ll subscribe to that theory. Very clear and unsurprisingly obvious to those with an open mind. It makes it uncomfortable to reflect on just how much this mishap was applauded by those who should know very much better. AGE was redacted form the LOG13 data, but AGE was not redacted from the PLOS one data..
As the PLOS One paper included at least two 14 year olds (anonymous respondents) that belived in moon hoax, we know that Lewandowsky et al think it is OK to include children believing in conspiracy theories for a psychological paper of this nature.. If there are any at all, it should in my opinion, be withdrawn completely. 2 earlier reference to LOG 13 – BOTH by Wray Herbert of the APS – could be added to your timeline..
Ruth: Thanks, Barry, I’ve added the first link. Wray hyped it up even more than Adam – over 400 comments on the Huff post version of the article. You have already gone well beyond any call of duty on this, but you might consider a nonparametric correlation coefficient (Spearman?) and test of significance for the data. This also probably reveals how dated my statistical knowledge is! But this approach might give a quite clearcut statistical measure of how limited the association is, using a minimum of model assumptions. From the slides – Lewandowsky publicly presented LOG13 ‘results’ at Monarsh University Sept 2010… Emails invites/reminders were still going out to sceptics at the time..
Ruth, what confounding effect might one expect if one of the conspiracy theories is that climate science heat proponents are part of a conspiracy? Climategate suggests that there is (was?) a lot of collusion and pal review among the main players – even discussions about erasing emails, hiding and destroying data, subverting the FOIA, getting rid of the MWP and LIA, selection of only those trees for ring analysis that supported the “theory”. You bet there is a lot conspiracy right in the middle of climate theory itself. It would be interesting to see plots for a survey that included climate warming data manipulation as one of the conspiracies listed! Both Lewandowsky’s surveys contained a question about a climate science conspiracy: “The claim that the climate is changing due to emissions from fossil fuels is a hoax perpetrated by corrupt scientists who want to spend more taxpayer money on climate research”. It’s clear that including that question in the calculation of CY would dominate the relationship between CY and CLIM (and Lewandowsky rightly excluded that question from his analysis, as did we). Agreement with the ‘climate science conspiracy’ question showed a strong (negative) correlation with ‘climate science belief’, reported as r = -.57 in Lewandowsky’s Reply (for the panel dataset). So, this just shows that climate sceptics are selective about which conspiracy theories they endorse! Ruth, a couple of points about Lewandowsky’s selection of CY results to report. Lewandowsky’s survey included a question about Iraq, results of which were not included in the Katabasis dataset. I have another version of the data (obtained by Roman with answers to this question.) Second, Lewandowsky’s ethics approval included a question about whether there was a conspiracy to withhold secret energy-saving motors – despite this question being on the approved schedule, Lewandowsky withheld the question from the survey. It’s a question that obviously would tilt his CY index in a direction that he didn’t want. Thanks, Steve. I’d read about the existence of the Iraq question but did not know that data had been obtained. Interesting in the light of Lewandowsky’s current insistence on his blog that no changes can be made to the research design after the data was collected! Can you rearrange the letters in “What Lysenko Spawned” to produce the name of a well-known social scientist? Am I the only one who finds it, well – at the very least somewhat odd – that Lewandowsky et al should have chosen to keep their “response(s)” to your Commentary behind a paywall?! Is this simply because they declined to cough up the cash (as you and Jonathan have kindly done for the benefit of all) or are you aware of a different reason for their apparent choice to protect their projections and objections?! Many thanks, Hilary. I think there could be various reasons for the Reply being paywalled. For one thing, we were pleasantly surprised to find we could get a considerable institutional discount on the advertised $3000 Open Access fee, bringing it down to a cost we could afford ($375) – $3000 would have been out of the question. Perhaps L et al did not ask what it would cost in their case, or perhaps their institutions do not subscribe to the discount scheme. They may not have had funds available for that purpose. Researchers’ funds are tightly circumscribed, and it is unusual to decide to spend one’s own private funds on OA! (The whole issue is quite contentious in academia at the moment – journals get the manusripts and peer-reviewing for free – and then want to charge the authors for open access). I associate my opinion with Hillary Ostov’s above, my hat’ off too. One would think it obvious that climate debate is associated with a political party debate in the USA and in many countries, and thus the particular implications of the individual conspiracies reflection on party loyalty would be highly relevant. And, some conspiracies are actually more plausible that others. One would think this whole undertaking with be extremely hard to compose in an unbiased fashion. Thanks, Ron! You make very good points which potentially could be tested in Lewandowsky’s datasets. But we don’t plan to try to analyse the data further given the quality problems with both datasets (which would take too long to enumerate!). There are no questions (as far as I recall [Update – no, I’m wrong, the panel survey does ask for Conservative-Liberal preference]) on political affiliation, but the questions on free-markets could potentially be used to infer that information. However, those questions are so poorly designed (e.g. conflating environmental with market concerns, ambiguous wording, two-clause questions requiring a single response, etc.) that I would not think it advisable to do so. And the average level of endorsement of most conspiracies was really very low (and expressing various levels of doubt, as others have pointed out, does not imply ‘endorsement’), so there is very little actual signal in the data. Update 2: For what it’s worth, in his PLOS paper, Lewandowsky found a slight negative correlation between free-market beliefs and conspiracy endorsement, and between Conservatism and conspiracies – i.e. liberals were more likely to be conspiracy theorists (see table 4 in that paper). But as you suggest, that likely depends on the conspiracy theories included in the survey. In the HOAX paper Lewandowsky also stated his findings on free market relationships with conspiracy beliefs “paralleled” previous research in Heath 2006. A serious problem since Heath 2006 actually found there was NOT any such correlation between free market and conspiracy. Congratulations, Ruth and Jonathan, on your excellent work showing that Lewandowsky’s analysis was faulty ,and your perseverance with getting your comment accepted by the journal concerned. @Foxgoose @rdrake98 you guys can talk and conspirasize amongst yourselves now, thanks. Well, apart from my little comment back. You can see that by clicking on the date and time in either case. At that we began to mock a little. We didn’t trust such an account as fully objective science. But the ease and confidence with which even a relatively minor ‘insider’ resorts to attributing full-blown conspiracism to two sceptical and slightly sarcastic strangers is I think part of Dr Lew’s legacy. Chris Mooney has an article on the Washington Post blog about our Commentary and Lewandowsky’s reply ‘The hotly contested link between science denial and conspiracy theories’ in which he implies we’ve identified a technical statistical issue too complicated for anyone to understand. Jonathan has commented there, explaining our finding quite simply. I am delighted to be portrayed as Dana Scully in the photo accompanying the article! However when someone later patiently works through the peer review to point out the speciousness of the main headline worthiness of the original work we now learn how boringly “technical” that is, and gosh yes, maybe that was weak but hey! there’s all this other stuff too about free-market ideation! Bless. This level of science media reporting. Is Just. Wonderful. I have to believe that we are talking angels on the head of a pin here. The survey questions themselves do not have a demonstrated ability to evince the classifications suggested, whether CY or CLIM, with reasonable precision. The data collection was atrocious — anyone could game the answers and there was no quality control on the selection of participants. It was blatantly obvious what the survey was trying to demonstrate; and responders — skeptic and believer alike — could answer in accordance with what they wanted their answers to show. Lewandowsky is psychologically corrupted by hubris — I did a survey of myself and regressed the result and wrote a paper and published it on my home printer and PROVED IT — so there. It doesn’t dignify the counter-thought /response it has received, though the efforts are appreciated. Lewandowsky published two papers. The data collection methods of the blogs survey were atrocious, as you say, but we found the clearest results from the panel survey data (Lewandowsky’s PLOS paper) which surveyed a US panel – people with no particular interest in climate, more professionally surveyed. The figures in our Commentary come from that dataset. But when we applied the same method to the blogs survey data, we found the same curvilinear relationship, showing that whatever that relationship means, it was consistent across the two datasets. You are nice and reasonable and thoughtful and I appreciate that. I trust your comment on the non-survey data set. I would still say that the study was nothing but a conclusion in search of data. Let’s go outside the study for some intuitive thoughts. The kind of skepticism I am interested in involves curiosity about the underlying science, its complexity and nuance. Generally this skepticism comes to the conclusion that CO2 has a modest warming effect, but the evidence for catastrophic effects doesn’t exist and the policy prescriptions based on such non-evidence are unjustified, not to mention many times more pernicious than even the reasonably evident effects. With that, I would find it nearly impossible that the people that fall into that kind of thoughtful skepticism believe in the non-scientific baloney that was asked about on the survey. However, it is exactly that kind of skepticism that Lewandowsky set out to disparage. And I don’t think the survey was able to test for that kind of thoughtful skepticism. Lewandowsky simply wanted to wrap his belief, i.e., you have to be a cuckoo bird to disbelieve catrostrophic global warming, into an academic-scientific package. He was not interested in learning any truth. I do believe he suffers from hubris. Dumb and incurious people (or even smart ones with hubris) can be propagandized to believe any sort of malarkey — we don’t need further studie to demonstrate that. Congratulations on getting this commentary published. You reach a very similar conclusion to what I did last year in my post Conspiracist Ideation Falsified?, but the statistical analysis here is far superior. It is an overlap. The results presented here were derived earlier, but only just published. Thanks Kevin for these kind words! We were aware of some of your early work on this, and I think we saw your original post shortly after we submitted our first manuscript. As you say your methods are very similar to what we did, and the conclusions even more similar. On the methods, while we would quite like to take credit for the idea of using loess smooths, that was actually suggested by one of the referees, and as soon as we plotted the first graph we knew s/he was absolutely right. As for conclusions, I prefer the reverse formulation (that people with no opinions in one area are very likely to have no opinions in others), but fundamentally the two forms are pretty much equivalent. Thank you Jonathan for the acknowledgement. Your use of the loess smooths is far in advance of the my looking at the data in a number of ways on a spreadsheet. The fact that people can independently come to the same or similar conclusions from different approaches shows the robustness of those conclusions. The blog survey data shows that it was only by very narrow forms of data analysis that Lewandowsky et. al could reach the conclusions they did. Conspiracist ideation is used as a reason to justify a self-selected group of experts having a monopoly in both ideas and data evaluation. The way they arrived at the conclusions from survey data is strong justification for the opposite – pluralism in analysis, then let others compare and contrast the relative strengths of the results. Ruth: Happy Easter, Jane F. No further comments along these lines, please. What I still miss in this dicussion is “What exactly is conspiracy ideation”. Sometimes some people already know what others only believe or don’t believe. Sometimes the worst conspiracy in the end becomes history and everybody says “I always knew it was true”. About the death of Kennedy we Europeans have no clue, but about the weapons of mass destruction in Iraq, we know that the rumours were untrue. No need for ideation if you know it’s not true. But for catastrophic climate change, when the worst ever climate change in the history of the universe happended 25 years ago, I’m a little bit skeptic. That doesen’t mean that I “know”. I just “don’t know”. But about the moon landing, I know that it is not a hoax. Can I prove it? Maybe! Am I just convinced or really sure? I’m totally convinced. All this makes no sense to me. Maybe in the US more people are skeptic about such obvious things. Catastrophic Climate change is everything but obvious?! You make good points. Certainly the range of responses to the individual conspiracy questions varied a lot, as some of the conspiracies were simply more plausible than others. But we haven’t looked into that in detail. There was apparently a question on WMD in Iraq in Lewandowsky’s original (blogs) survey but the responses don’t appear in the publicly available data set. presumably because it is a ‘leftish’ and we believe in climate change conspiracy.. and he didn’t want those results getting out.